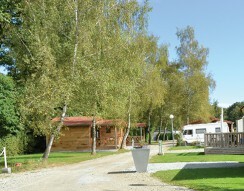 Stay at one of our campsites in the Vosges and sample some of France’s great culinary specialities including quiche lorraine and potée – a type of stew, accompanied by the wines of the Moselle. Or try one of our campsites in Alsace, famed for its white wines including Riesling, Gewurztraminer and Sylvaner and its beer-making tradition. 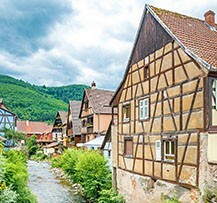 Non-culinary delights on offer include the local folklore and festivities, the Ballon d’Alsace, Alsace’s brightly coloured, half-timbered houses with their flower-bedecked balconies and the region’s rich historical heritage. 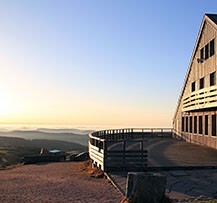 Whether you enjoy a camping holiday in the Vosges moutains in summer or winter, the stunning landscapes of the Grand Ballon will leave you with memories of a holiday you’ll never forget. 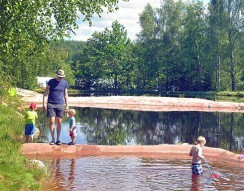 A camping holiday in the Vosges offers fine good, beautiful scenery and a host of outdoor sports and leisure activities. So don’t delay! 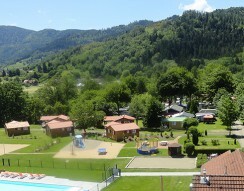 Book your campsite in the Vosges now and come and explore the glorious mountains of the Vosges! 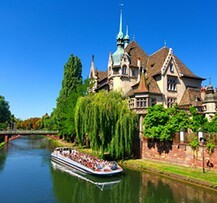 Flower-filled meadows, the colourful architecture of Colmar and Strasbourg, great Alsatian wines and, of course, the Ballon d’Alsace. 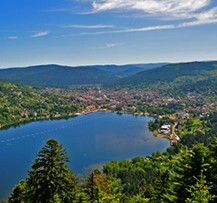 These regions include the Vosges mountains which rise to 1362m above sea level at Hohneck. 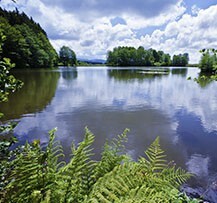 The Vosges are characterised by the gentle, rounded contours of their mountains and valleys. 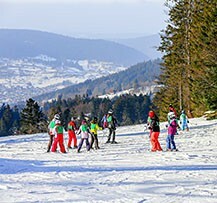 Our campsites in the Vosges are located all along the mountain chain in the Vosges, Alsace and the Territoire de Belfort, never far from pine woods, lakes and ski resorts. For nature lovers, the Ballons des Vosges Regional Natural Park offers a wide range of natural habitats and scenery that will just take your breath away, all easily accessible from our campsites in the Vosges. Largely wooded, the Vosges also boasts numerous lakes and rivers, glacial cirques and rocky cliffs – all just waiting to be explored as they change with the seasons. 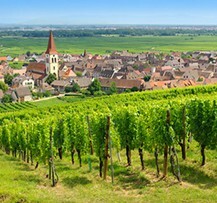 Our campsites in Alsace make a great base for exploring the food and wines of the region, particularly the Route des Vins d'Alsace which runs from Thann to Marlenheim through world-famous vineyards and picturesque villages.